inherit acls = yes: The assigned access control lists (ACLs) are inherited. This parameter can also be set in the release. store dos attributes = yes: The extended attributes of a Windows system are also managed. You can also set this parameter in a share. vfs-objects = acl_xattr: Ensures the Windows-compliant management of permissions in the filesystem. This parameter can also be set directly in the share. interfaces = 192.168.56.210: Sets the IP address where the service will receive requests. You can enter either the IP address or the device name here. bind interfaces only = yes: Enables the specification of an interface. If the system is configured with several IP addresses, Samba will bind only to these specific interfaces. client ipc min protocol = smb2_10: IPC requests are only accepted by systems with at least Windows 7.
client min protocol = smb2_10: Connection requests are only answered by clients from Windows 7.
disable netbios = yes: NetBIOS is not supported. The server no longer appears in the network environment of the clients. However, connections can still be made. What happened here? Because you have set the minimum protocol to version 2.1 in the smb.conf file, smbclient cannot connect. The connection only works if you use a protocol newer than 2.0 (see Listing 3). This example reveals that there is no master for NetBIOS in the domain – all domain controllers and the file server no longer use NetBIOS. What does the list of ports on the server look like now? To find out, use netstat again (Listing 4). Two ports have been added. One is TCP port 445, which is the port for the SMB connections, and the other is TCP port 139, which provides SMB connections via NetBIOS. However, because NetBIOS has been disabled on the server, you can also disable this port. To do so, add the smb ports = 445 line to smb.conf in the global area and restart the service. A new test with netstat then only shows port 445 as open. Testing from the outside with nmap also shows only two open ports. Running smbclient will only output an error message that it always connects via NetBIOS. Now comes the point that makes the server usable in the first place: setting up the first share. Here, you want create an administrative Windows share to which only the Domain Admins group has write access, similar to drive shares under Windows. The directories are then made available to the users in this share. You can then assign the directories created there to users in individual shares with group policy objects (GPOs). As you can see, no parameters for access rights are entered here. All authorizations are assigned from Windows. Now you want to test whether it is possible to create a connection to the share. To do this, log on to a Windows client in the domain and create a network connection (Figure 1). Figure 1: Success! The first connection is established. To be able to create an authorization structure and a new share, you now create the Departments folder under Windows with a Production sub-folder and assign all rights for the domain admins to the Departments folder. On the system are the Production and Administration groups (Figure 2); the directories are now assigned to these groups accordingly. Figure 2: Two folders set up in the Departments folder: Production and Administration. If you now try to access one of the folders as a domain administrator, you will only see an error message stating that you do not have the required rights. The behavior at this point is therefore identical to that on a Windows server. The rights of the two directories on the file server are shown in Listing 5. You can see by the + at the end of the authorizations list that the POSIX ACLs are also set in addition to the filesystem rights. Listing 6 shows the ACLs of the Production folder and the complexity of the authorization assignment. For this reason, you should always assign authorizations from Windows (Figure 3). 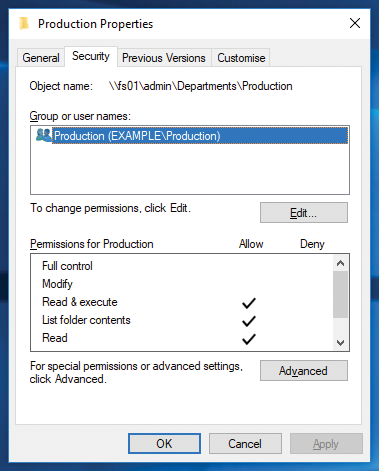 Figure 3: Rights set in Windows for the Production folder. The browseable = no parameter means that this share is a hidden share, just like a $ share under Windows. The hide unreadable = yes parameter ensures that you only see entries for which you have at least read access. Because all employees only have rights to their department's directory, they only see that departmental directory. Unfortunately, this parameter also has its pitfalls, because the more subdirectories and files you have in the Departments folder, the longer access can take, because the system first needs to check the access rights in all subdirectories. Therefore, test the parameter in detail in your environment before using it. After restarting smbd, you can read the configuration with testparm. You will see that the registry is now used for configuration. If you start Regedit on a Windows client as a domain administrator, you can connect to the registry of the file server, read and change the settings, create new keys for a new release, or create new values within the existing keys.